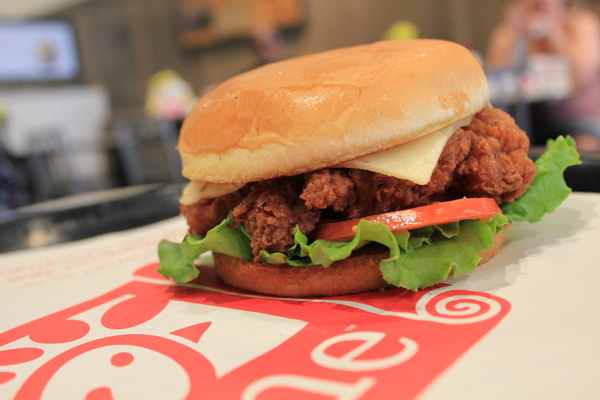 When Chick-fil-A opens in District House, students should try the deluxe spicy chicken sandwich. Everyone on campus is talking about District House and the vendors that will fill the J Street-sized holes in our hearts. We still don’t know for sure when these restaurants will open, but all of the future vendors currently have storefronts in D.C.
We sampled the restaurants’ food and drinks so you know exactly what to order when they finally open on campus. Chick-fil-A is known for its classic chicken sandwiches, but the spicy version ($3.29) adds a kick that sets the sandwich apart from the rest of the menu. It’s got enough flavor without burning your tongue and pairs well with their ever-greasy, yet delicious, waffle fries ($1.55). Be warned that the Chick-fil-A coming to campus is an express version, meaning it won’t have the full menu that’s available at the nearby Columbia Heights and Crystal City locations. Beef N’ Bread features a variety of sandwiches, salads and milkshakes, but it’s no surprise that a restaurant with “beef” in the title slices a good roast. The Chinatown roast beef sandwich ($8.99) combines two of the restaurant’s staple sauces — wise sauce and jalapeno sauce — to create the perfect blend of spicy and savory flavors. A slice of avocado and tomato adds crisp balance, with cilantro and basil topping off the medley. GRK Fresh Greek offers a variety of Mediterranean food, but the yeero — how the menu spells gyro — is by far the best. There are countless tzatziki and meat choices for endless combinations. The pork yeero ($8.10) with the traditional GRK tzatziki sauce is made with scallions, cucumber, mint and lemon zest that mix cool, crunchy and savory flavors together in a warm pita. Sol Mexican Grill is like Chipotle because customers can create their own meals, but the restaurant’s traditional Mexican street tacos set the menu apart. The al pastor street tacos ($3.00 per taco) are filled with juicy and flavorful pork, cooked onions, tangy cilantro, spicy salsa taquera, creamy avocado and crisp radishes to create a satisfying flavor combination. Unfortunately, Sol Mexican Grill is like Chipotle because you’ll have to pay extra for guacamole. New York is known for having the best pizza in the U.S., which GW students from the Empire state will be quick to remind you. Wiseguy NY Pizza lives up to the authenticity of a New York slice. The Margherita ($2.99 per slice) — the most traditional Italian pie — combines sweet tomato sauce, chewy mozzarella, fresh basil and flaky parmesan cheese to make all of your pizza dreams come true. If you want to take the healthy route, go for the fresh mozzarella salad ($3.99), which contains the same ingredients of the pizza in a caprese style. Get into the spirit of fall, no matter the season, with the pumpkin chai latte ($4.05). A twist on the classic chai latte, this drink features light spices to warm you up when the weather finally cools off. Try pairing it with a chicken chorizo flatbread ($4.45) for a breakfast delight. Peet’s serves breakfast until an hour before closing, so you can enjoy this combination whenever you have a hankering. This article appeared in the September 12, 2016 issue of the Hatchet.